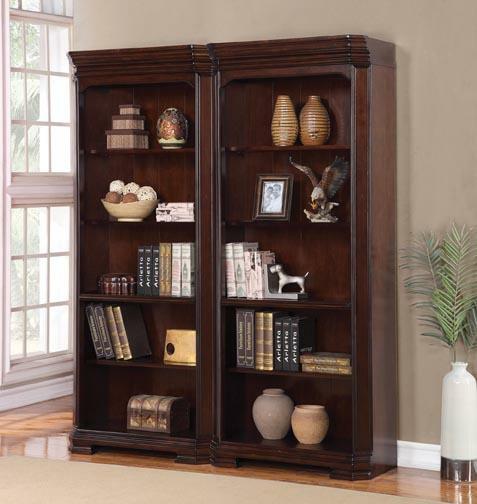 The Westchester Bunching Bookcase by Flexsteel Wynwood Collection at Great American Home Store in the Memphis, TN, Southaven, MS area. Product availability may vary. Contact us for the most current availability on this product. Drawer / Shelf Construction All drawers have a fully dovetailed construction. All drawers feature wood on wood guides to provide silent and smooth operation that will never wear out. Adjustable wood and glass shelves for added versatility. All vertical glass elements are beveled to add depth and design interest. Construction: Case All cases have corner block construction for added stability. Backs of cases are screwed on as opposed to stapled for structural strength. The philosophy of Wynwood Furniture is to make each customer 100% happy. Their consultants travel all around the globe and bring the latest trends in colors, shapes and textures to market here in the US. They use unique materials to design exclusive furniture and choose finishes and hardware for each furniture piece carefully. The designs are checked over to ensure that Wynwood furniture collections are not only gorgeous but also durable and functional. In their process of designing furniture, hundreds of talented people are involved, all of who share the same goal of making customers satisfied. The Westchester collection is a great option if you are looking for Traditional furniture in the Memphis, TN, Southaven, MS area. Browse other items in the Westchester collection from Great American Home Store in the Memphis, TN, Southaven, MS area.